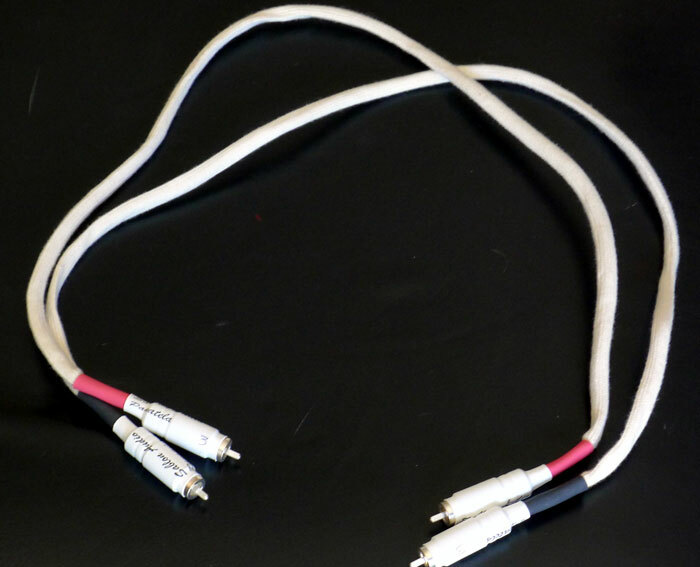 For years I kept trying silver audio cables, including those from Acoustic Zen, AudioQuest, D.H. Labs, Mark Levinson, Nordost, van den Hul, and some that I have surely forgotten. I’m not saying that none of these weren’t really good cables, but they all in the end sounded like silver cables, hard to put into words, but not quite as organic, a little too much shimmer on top, and a little overly tight in the bass. Though better than most cables, they were not as musically satisfying to me as the very best OHNO continuous cast single crystal copper cables. Then I heard the Audio Note Sogon silver cables and I knew it could be done; a cable that had all the detail and air of silver cables, but could still let me hear all the music without sounding like silver or copper cables. The only problem with Sogon is that even most of the one percenters, the top 1% of the riches people in America, couldn’t afford them. Moreover, as good as the two more affordable Audio Note SP cables sound, I prefer the even more affordable Audio Note XL copper cables, and surely the Audience and Teresonic copper cables over the Audio Note SP silver cables. Then, as I started to use Shindo preamps I discovered Ken Shindo had also captured silver cable magic, but in a much more reasonable price bottle. Since the first of the year I’ve heard two more silver cables that sound like music: the Teresonic Clarison Silver EXP cables, and now these wonderful Panatela Interconnects from Sablon Audio at an even more reasonable price. Mark Coles of Sablon Audio says that after over a decade as an audiophile experiencing numerous high-end power cords from leading manufacturers, constructed from a plethora of materials / conductors / geometries, he decided to make some himself. 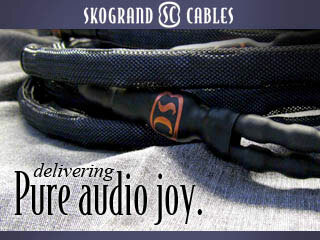 He says his goal is to provide audiophiles with a world-class performing cable at a real world price. To date, he has produced two power cords and an interconnect. The interconnect is called the Panatela, and unlike the other silver cables mentioned above it uses cryogenically treated, stranded silver conductors. It’s insulated with a natural fiber dielectric, no shielding is used, and Mark designs it with a extremely low capacitance of 5.7pF per foot. They are terminated with Xhadow RCA connectors, which allow the silver conductors to be connected to the contacts with a set-screw, avoiding the sound degradation he says comes with solder joints. All of the signal-carrying components of the Panatela interconnects have undergone cryogenic treatment. The Panatela is finished in a white cotton covering that gives it a rather unique appearance and allows it to be very flexible and easy to use. One other nice thing is that they are pre-broken in with an Audiodharma Anniversary cable break-in device. The Panatela interconnects that I have in for review are the latest versions that Mark released in 2012. I used them between the DAC and the preamp, and also between my Shindo Giscours preamp and Wavac EC-300B SET amplifier. I had them at the same time I had the Teresonic and the Shindo silver cables in, so I had very good cables to compare them with. Let’s start with how they affect the tonal balance of the equipment they are used with. The good news is that in neither setups of DAC/preamp or Giscours/EC-300B did they have any negative effect on the sound. If anything, they might lean ever so slightly towards less brightness or edge than most silver cables. In fact, the Panatela was one of the smoothest sounds I have heard from my system, without any of the false sheen that some silver cables give to the sound. The presentation was very organic with nice texture. With the Panatela in my system, timbre was excellent and the colors of music came alive beautifully. This was the one area in which I feel the Panatela cables match or exceed any cable I have had in my system. This strength alone was enough to make me want to hear their speaker cable, since this is the same area my Shindo speaker cables also excel in. Instruments such as strings and cymbals were nicely detailed, yet very smooth and refined. Female vocals sounded wonderfully seductive. Again with the Panatelas, my system was free of grain or sense of electronic edge or glare. My system was very quiet with these cables, but this is one area in which they did not quite match my Shindo cables. I still believe this has something to do with how Shindo grounds their preamps, even though Mark says the Panatelas should work just as well with the Shindo grounding. Backgrounds were still nice and quiet with very nice low-level detail in evidence; I think this difference would only be noticeable on Shindo equipment. I say this because I did not hear this difference when I used them between the Auditorium 23 Homage T1 SUT and the ASR Emitter 1 Exclusive integrated amp. The Panatelas’ midrange was full bodied and at the same time very detailed. I found them to be almost the perfect cable to use between the DAC and the preamp. The soundstage of my system was very satisfying with these cables. I find soundstages that wow me quickly begin to distract me from the music. However, the layering, width, and depth with Panatelas were superb. Images appeared vividly yet very naturally on the stage with a good sense of space and air around them. With the Panatelas in my system, I could hear deep into the layers of the soundstage. The bass, especially the upper bass, and lower midrange of the Panatelas is another area where these cables are just sublime. They let you hear the air around and within cellos and standup basses. They also let you hear the wonderful textures of music in this frequency range. I hate to try to do this, but I know if I was reading this review I would want to know how well do they compare? The Teresonic Clarison Silver EXP cables are probably the most neutral of all three cable I had on hand. They are very fast, very quick, with great bass impact. The Shindo cables fall in between the two in regard to tonality. The Shindo are definitely the most organic of the three, with the Panatela coming in a very close second. As the Panatela is the warmest of the three, I would certainly pick it for digital playback. Now, don’t get me wrong in this comparison – these three cable sound much more like each other than they do different. The Sablon Audio Panatela is easily one of the four best interconnects I have used in my system. This is not even considering price. When you take into account their price, then, I am just blown away. They allow my system to do one of the most fundamentally important things it can do: They allow the system to be fun to listen to music on. Add to this that the Panatela has a warm and natural sound, while still having remarkable detail and you simply have one of the best interconnects I have ever heard. Have you any experience with the Sablon Reserva USB cable yet? My experience with the Sablon Reserca USB cable for my car audio system, that’s right, car audio has been brief but outstanding. Right away the difference between the Sablon and the higher end Kimber USB cables was all too plainly noticeable. In short, the Sablon kicked the crap out of the Kimber to the point that I mused, what’s the point of having Kimber. No contest. The mids alone demonstrated the Sablons worthiness and stunning clarity. But the upper range…ahhh, there is where the magic occurred. Have a Sablon USB with my Aurender W20 and Nagra Classic DAC. Very satisfied with the result, although it has taken a lot of time before it started to perform to an outstanding level. Very happy with it. Recommended.